The Pending Home Sales Index, a forward-looking indicator based on signed contracts, decreased 4.3% in December 2012 to 101.7, down from the revised 106.3 in November. The December 2012 PHSI was 6.9% higher than the same period a year ago. Regionally, the National Association of Realtors (NAR) reported that only the Midwest was in positive territory with the December 2012 PHSI increasing 0.9% in that one region. Year over year, only the West was down as the PHSI was down 5.3% in that one region. The PHSI in the Midwest was up 14.4% from its level a year ago, and the South and Northeast were up 10.1% and 8.4% respectively. If contracts closed at the same time they were signed, this graph would be the correspondence between sales and the PHSI. So the PHSI is a good indicator of what will likely happen to existing home sales when the contracts close in coming months. 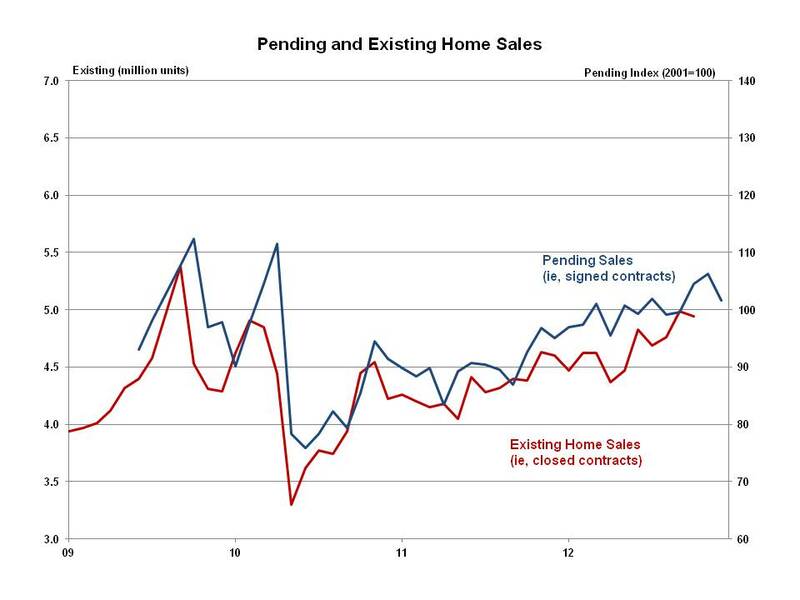 We anticipate that the January 2013 and February 2013 existing sales data will reflect today’s pending sales report, suggesting that the strong upward trend in existing home sales is likely to pause as we move to 2013.